USDCAD gained little after its freefall to one-month lows, rising slightly above the 50% Fibonacci of the upleg from 1.2781 to 1.3663 to start consolidation. Should the market improve, the 38.2% Fibonacci of 1.3325 could reasonably act as an immediate resistance as the bulls were unable to break that mark in recent sessions. If this proves a weak obstacle instead, then the focus will shift up to 1.3385, taken from the high on June 27. 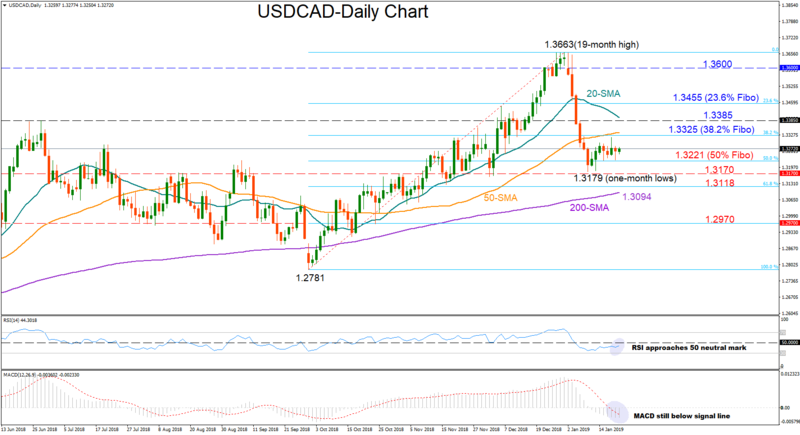 Higher, the 23.6% Fibonacci of 1.3455 and the 1.36 round level could be next in target. Alternatively, in case negative pressures dominate, the area between the 50% Fibonacci of 1.3221 and the 1.3170 barrier may appear restrictive once again, while below that it would be more interesting to see whether the bears can pierce the 200-day simple moving average currently at 1.3094. A decisive close under that line could trigger steeper declines probably towards 1.2960, where the 78.6% Fibonacci is standing. In the medium-term picture, the positive outlook has somewhat faded after the sell-off from 19-month highs and is set to turn neutral below 1.3170. Yet the positively sloped 50-day MA, which continues to distance itself above the 200-day MA,suggests that the bull market could hold for longer. Previous articleCurrencies: EUR/USD Decline To Slow?